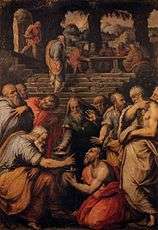 Giorgio Vasari, Six Tuscan Poets, c. 1544. From left to right: Marsilio Ficino, Cristoforo Landino, Francesco Petrarch, Giovanni Boccaccio, Dante Alighieri and Guido Cavalcanti. 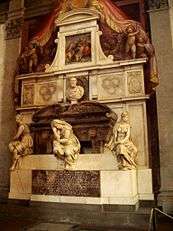 In 1529, he visited Rome where he studied the works of Raphael and other artists of the Roman High Renaissance. 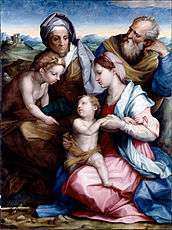 Vasari's own Mannerist paintings were more admired in his lifetime than afterwards. 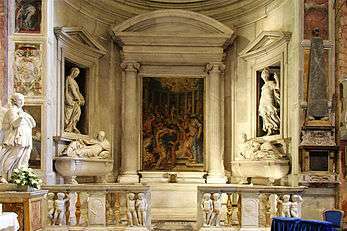 In 1547 he completed the hall of the chancery in Palazzo della Cancelleria in Rome with frescoes that received the name Sala dei Cento Giorni. 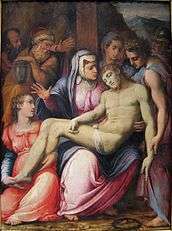 He was consistently employed by members of the Medici family in Florence and Rome, and worked in Naples, Arezzo and other places. 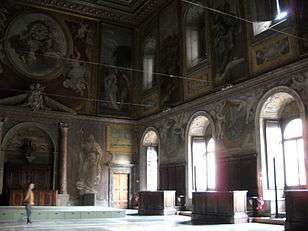 Many of his pictures still exist, the most important being the wall and ceiling paintings in the Sala di Cosimo I in the Palazzo Vecchio in Florence, where he and his assistants were at work from 1555, and the frescoes begun by him inside the vast cupola of the Duomo were completed by Federico Zuccari and with the help of Giovanni Balducci. 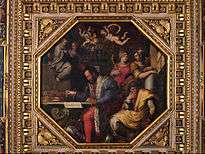 He also helped to organize the decoration of the Studiolo, now reassembled in the Palazzo Vecchio. 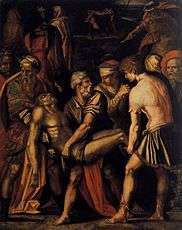 Among his other pupils or followers are included Sebastiano Flori, Bartolommeo Carducci, Domenico Benci, Tommaso del Verrocchio, Federigo di Lamberto (Federigo del Padovano), Niccolo Betti, Vittor Casini, Mirabello Cavalori (Salincorno), Jacopo Coppi (Jacopo di Meglio), Piero di Ridolfo, Stefano Veltroni of Monte Sansavino, Orazio Porta of Sansavino, Alessandro Fortori of Arezzo, Bastiano Flori of Arezzo, Fra Salvatore Foschi of Arezzo, and Andrea Aretino. 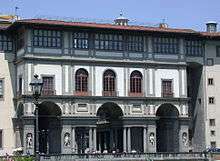 Aside from his career as a painter, Vasari was also successful as an architect. His loggia of the Palazzo degli Uffizi by the Arno opens up the vista at the far end of its long narrow courtyard, a unique piece of urban planning that functions as a public piazza, and which, if considered as a short street, is unique as a Renaissance street with a unified architectural treatment. The view of the Loggia from the Arno reveals that, with the Vasari Corridor, it is one of very few structures that line the river which are open to the river itself and appear to embrace the riverside environment. 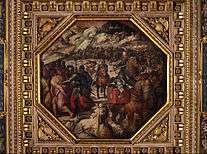 The work has a consistent and notorious bias in favour of Florentines, and tends to attribute to them all the developments in Renaissance art – for example, the invention of engraving. Venetian art in particular (along with arts from other parts of Europe), is systematically ignored in the first edition. 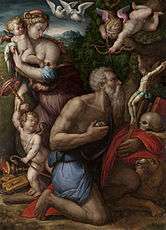 Between the first and second editions, Vasari visited Venice and while the second edition gave more attention to Venetian art (finally including Titian) it did so without achieving a neutral point of view. According to the historian Richard Goldthwaite, Vasari was one of the earliest authors to use the term "competition" (or "concorrenza" in Italian) in its economic sense. 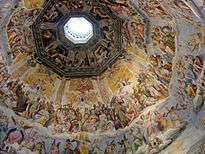 He used it repeatedly, and stressed the concept in his introduction to the life of Pietro Perugino, in explaining the reasons for Florentine artistic preeminence. In Vasari's view, Florentine artists excelled because they were hungry, and they were hungry because their fierce competition amongst themselves for commissions kept them so. Competition, he said, is "one of the nourishments that maintain them." 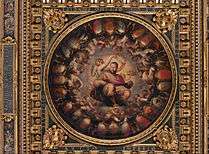 ↑ "Six Tuscan Poets, Giorgio Vasari". Minneapolis Institute of Art. ↑ The History of Painting in Italy: The Florentine, Sienese, and Roman schools, by Luigi Lanzi, page 201-202. ↑ Vasari, Giorgio. Dictionary of Art Historians, 2013. Retrieved 26 May 2013. Archived here. ↑ Vasari, Giorgio. 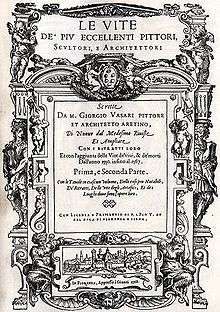 (1907) Vasari on technique: being the introduction to the three arts of design, architecture, sculpture and painting, prefixed to the Lives of the most excellent painters, sculptors and architects. G. Baldwin Brown Ed. Louisa S. Maclehose Trans. London: Dent. ↑ Richard Goldthwaite, The Economy of Renaissance Florence, 2009, pp. 390. This article incorporates text from a publication now in the public domain: Chisholm, Hugh, ed. (1911). 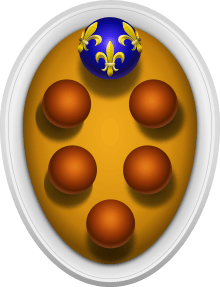 "Vasari, Giorgio". Encyclopædia Britannica. 27 (11th ed.). Cambridge University Press. Herbermann, Charles, ed. (1912). 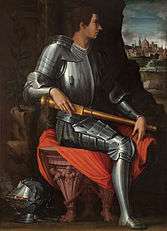 "Giorgio Vasari". Catholic Encyclopedia. 15. New York: Robert Appleton Company. Petri Liukkonen. 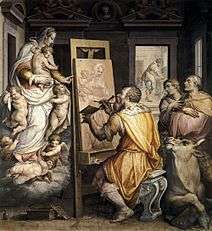 "Giorgio Vasari". Books and Writers (kirjasto.sci.fi). Archived from the original on 4 July 2013.